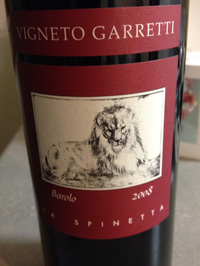 2008 La Spinetta, Barolo, Vigneto Garretti, DOCG, Piedmonte, Italy. The baby Campe from Giorgio Rivetti, the Vigneto Garretti is a real steal in the quality Barolo league, and the 2008 is really starting to come around, this is a great example of La Spinetta style and Nebbiolo. The 2008 is showing dark garnet color, rich details and robust density with beautifully refined tannins, good acidity and a long lavish finish. The nose opens with wilted roses, dark chocolate, tar and minty black licorice with a core of plum, raspberry, black cherry fruits. The background shows some nice vanilla scents, lavender and porcini notes as well as cedar and sweet tobacco all adding to the complexity and pleasures found it the Garretti. As a big fan of Rivetti’s wines, I really enjoyed this wine and highly recommend this rich and forward wine, it comes from Campe, a great vineyard and terroir which is proving a super foil to La Spinetta’s famed Barbaresco Crus, this is a Grand Cru site. This is going to be my Christmas 2013 wine! Drink 2014-2022, while still young and tight it really delivers hedonistic flavors even now.